Daniel Kahneman, recipient of the Nobel Prize in Economic Sciences for his seminal work in psychology that challenged the rational model of judgment and decision making, is one of our most important thinkers. His ideas have had a profound and widely regarded impact on many fields--including economics, medicine, and politics--but until now, he has never brought together his many years of research and thinking in one book. In the highly anticipated "Thinking, Fast and Slow," Kahneman takes us on a groundbreaking tour of the mind and explains the two systems that drive the way we think. System 1 is fast, intuitive, and emotional; System 2 is slower, more deliberative, and more logical. 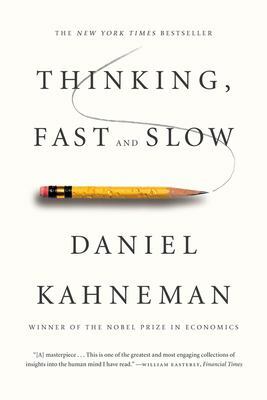 Kahneman exposes the extraordinary capabilities--and also the faults and biases--of fast thinking, and reveals the pervasive influence of intuitive impressions on our thoughts and behavior. The impact of loss aversion and overconfidence on corporate strategies, the difficulties of predicting what will make us happy in the future, the challenges of properly framing risks at work and at home, the profound effect of cognitive biases on everything from playing the stock market to planning the next vacation--each of these can be understood only by knowing how the two systems work together to shape our judgments and decisions. Engaging the reader in a lively conversation about how we think, Kahneman reveals where we can and cannot trust our intuitions and how we can tap into the benefits of slow thinking. He offers practical and enlightening insights into how choices are made in both our business and our personal lives--and how we can use different techniques to guard against the mental glitches that often get us into trouble. "Thinking, Fast and Slow" will transform the way you think about thinking.